Easter is quickly approaching. Many shops have been selling popular Easter-themed treats and decorations for several months now. The focus of Easter is moving more and more towards sweets and gifts – good news for confectioners and supermarkets. For example, according to the National Confectioners Association, every year confectionery manufacturers produce more than 16 billion jelly beans for Easter. 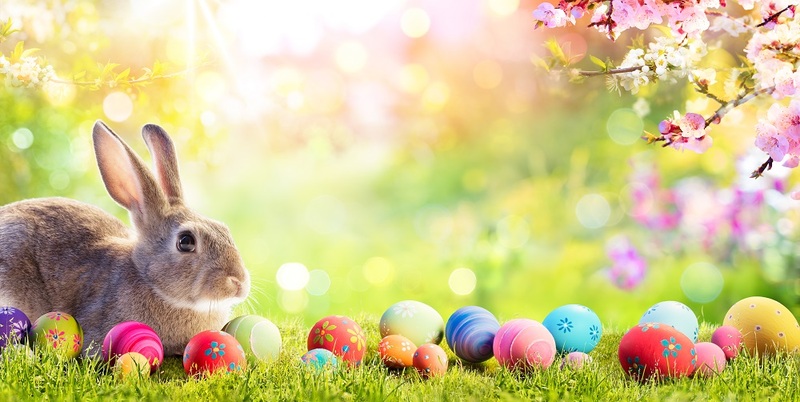 This poses a challenge for logisticians and supply chain managers, as during the months leading up to Easter they have to cope with increasing consumption, production and deliveries. This is gradually becoming easier to manage as more and more companies are digitalizing processes and adopting the use of intelligent software. But how do these intelligent systems compare to the supply chain mastermind that is the Easter Bunny? For decades, the Easter Bunny has been able to instinctively predict how much chocolate and eggs people will require. The Easter Bunny is therefore well aware that Easter increases people’s appetite for and consumption of chocolate. Unfortunately, not everyone is so naturally able. For a long time, supply chain managers had no exact overview of possible changes in sales under the influence of seasonal fluctuations. Digitalization is increasingly helping supply chain and logistics managers to make accurate predictions similar to those of the Easter Bunny. For example, modern warehouse management systems can greatly enhance inventory accuracy. Another enviable ability of the Easter Bunny: he handles masses of chocolate eggs. Of course, this requires a lot of tact and care, as well as accurate and efficient supply chain planning, including factors such as distance and stocks. Particularly when handling food, it is essential to plan the supply chain in such a way that the cold chain is not interrupted. Today, food has to meet high requirements in terms of quality and availability; these requirements are in conflict with the resulting costs. To meet these cost pressures, sales and inventory planning should be optimized. Forecasts concerning product sales can help here. Machine learning algorithms are able to improve forecasting by taking into account historical sales and inventory data as well as various external factors such as weather, holidays or product similarities. The Easter Bunny is omniscient and, like Santa Claus, knows exactly where his gifts are, at any given time, simply because of his supernatural abilities. The manufacturers of Easter goods are not able to achieve such a high level of traceability so easily. Transparency is becoming an increasingly important factor for customer satisfaction and fortunately there are now more innovative, simpler ways to track and trace. New technologies such as Blockchain are already being used to track every single ingredient, back to its origin and along the supply chain. For example, Carrefour applies blockchain technology from local dairy farms to the supermarket shelves to enhance traceability and connect its consumers to ‘the agricultural world’. Additionally, in and on the way to the production plants, many intelligent systems, such as those already in use in in-house and truck logistics, help to track where goods and materials for production are located. Thanks to the support of optimization algorithms, these systems not only help to achieve transparency, but also optimize truck routes and internal transports so that on-time delivery and production are ensured. The Easter Bunny traditionally picks and packs its gifts manually. This is also often the case in many warehouses and manufacturing companies – but not at the rapid pace of the Easter Bunny. The digitalization of processes offers companies many opportunities for automation. Examples include applications of augmented and virtual reality, as well as voice-directed technology in warehouses. These technologies can help to supplement the picking process in the warehouse with important information and thus make it easier. Employees can then use both hands for their tasks and are therefore faster. In the area of internal logistics, all transports can be controlled by the previously mentioned intelligent systems in the most efficient way possible, while ensuring greater material traceability and adherence to delivery schedules. In the factory of the Easter Bunny there is probably still an abundance of little helper bunnies However, partly due to the increasing worker shortage, more companies are using driverless transport systems in their daily operations. When combined with intelligent systems, the optimized transport orders can be assigned directly to them and transports can thus be automated. Each year, the Easter Bunny faces some challenges when supplying people with Easter delicacies. Of course, he always has to make sure that everything is planned 100% accurately. Unlike human supply chain and logistics managers, however, he has supernatural powers that help him to do so. Transparent processes, process automation and innovative technologies help to ensure delivery reliability and efficiency.